Hello! 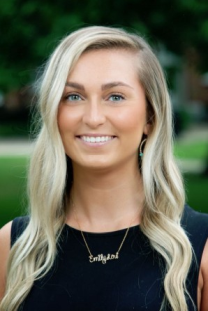 My name is Emily Smith, and I am a Senior Admission Counselor at Illinois College. I am originally from Springfield, which is located just 30 miles east of Jacksonville. I attended Lincoln Land Community College my first two years of college and then transferred to Illinois College for my last two years of education. I graduated from IC in 2016, receiving my Bachelor of Arts degree in finance with minors in economics and mathematics. During my years here, I was involved in cheerleading, a member of Student Alumni Association and Rotaract Club, and a Voices Informing Prospective Students (VIPS) Caller in the Office of Admission. From cheering at football and basketball games to attending fun homecoming events, my time at IC is something I will never forget. My experiences here helped me to grow and develop as a person, and I hope to help lead students to do the same. You can contact me at 217.245.3586 or by e-mail at emily.smith@ic.edu.